Prologue: In 2010, we took a family vacation to Colorado, which I've been to many times, but always in the winter, this time in August. We chose to visit my wife's uncle in Crested Butte and I brought along my Yamaha FZ1 on a trailer so that I could hit some twisties while I was there. 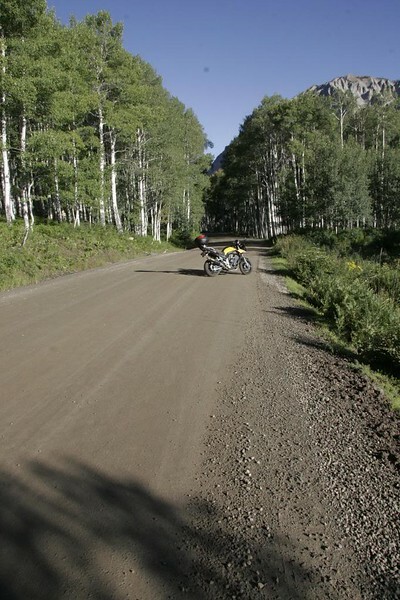 I took the FZ1 out and up Kebler Pass, and it handled well despite being a mostly unpaved road. I was amazed by the amount of Aspens back there and wondered what they'd look like in a month or so when they started turning. I vowed I'd return one day to find out. A month later Tina (OKAugust from the FZ1 Forum) posted up a thread titled "So you want to know what Colorado looks like in September?" and then proceeded to post some amazing photos that only served to solidify my plans to return. 2013 was to be the year. Started the planning and getting everything together. A month or so before the trip I noticed my fork seal leaking. It's leaked before and I was able to get the dirt out with a homemeade seal saver. This time was not so easy as it continued to leak after several cleanings. After attending a suspension rebuild class with some local guys (Bill, AKA DFW_Warrior from Two Wheeled Texans) I was ready to do this. A major issue with the odd FJR triple internal bushings caused the fork to bind up in such a way that even the local dealership couldn't fix it. 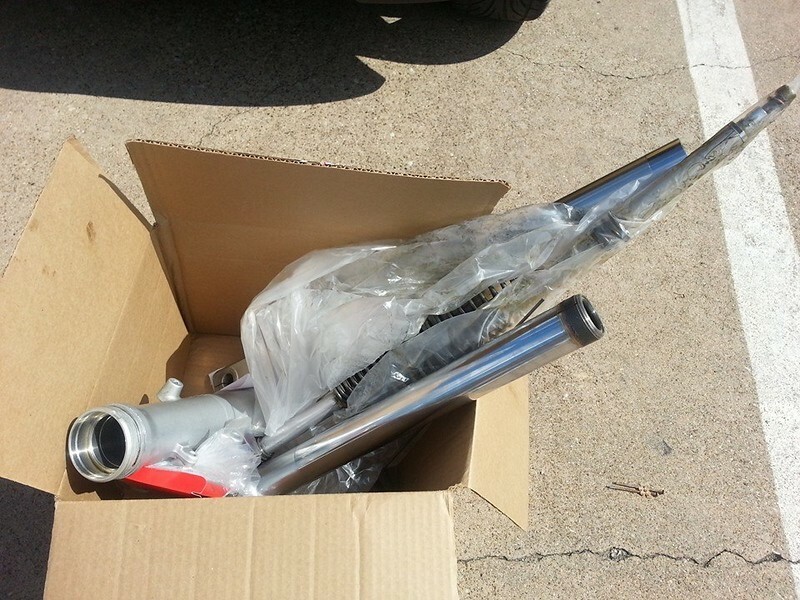 With the bike sidelined while I waited on parts, the Aspen foliage came and went. The box of "Trash" that was returned to me from the dealership. $1300 quoted worth of trash. 2014 was to be the year. Sigh. Again, shortly before the trip another maintenance issue popped up. My bike had been occasionally throwing an error related to the clutch and gear position sensors. Going through the manual I ultimately ended up replacing both the sensor and the clutch only to have to haul the bike into the shop to have errors cleared. Foliage missed again. 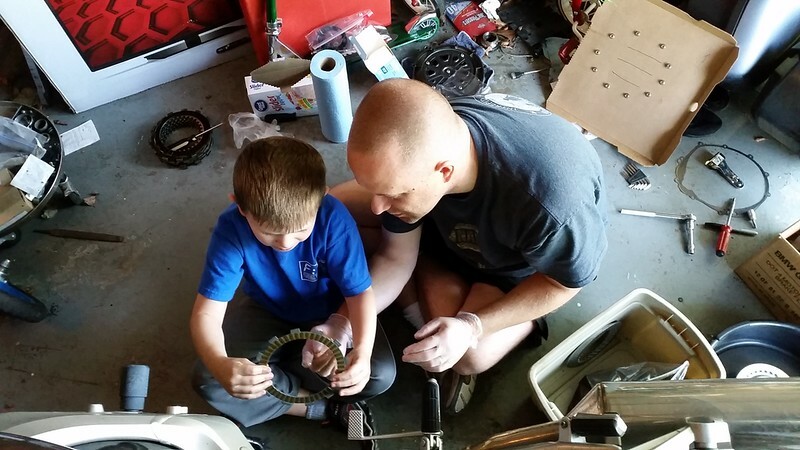 Still, got some time spent showing the kiddo how to do some maintenance on the bike.